Lodge Brothers are well known for their involvement within the community. Its been an extremely busy time for them celebrating Mothers Day and remembering all the mothers is a special way. Easter arrived soon after and once again they were involved making people feel special and spending time with folk in nursing homes. Lodge Brothers Funeral Directors Esher staff remembered those Mothers no longer with us by displaying flowers and a beautiful poem in the branch windows, inviting all to come in and share their special memories. District Manager Bill Wilde said “It is a special time of year to celebrate our Mothers, and at Lodge Brothers we wanted to be able to offer the local community the chance to remember those who are no longer with us. Mums may have passed away but it doesn’t mean that we ever forget them. Many passers by have come into the branches to say how much they have enjoyed the displays and the efforts of the staff”. 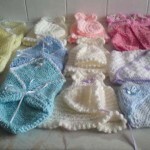 The wonderful parishioner’s of St John’s in Fulham Broadway have faithfully knitted for Preemies UK for over two years, Paul Bye of Barnes and Sons joined the St Johns Lunch Club and met the Knitters and to collect the latest batch of knitting destined for premature babies in hospitals around the UK. Barnes and Sons Funeral Directors Shepherds Bush are a distribution centre for the Preemies UK charity and they have been actively getting the local community knitting for charity. The requirement for knitted clothing remains strong and Barnes & Sons would love to hear from you should you wish to knit for charity.